Shimshon Obadia is an undergraduate student artist working on Daylighting the Classroom, a project in partnership with The University of British Columbia’s SSHRC funded Eco Art Incubator research initiative and École K.L.O. Middle School in Kelowna, B.C., Canada. The mandate of this project is to use eco art to re-envision education and the role of the natural world in school curricula. 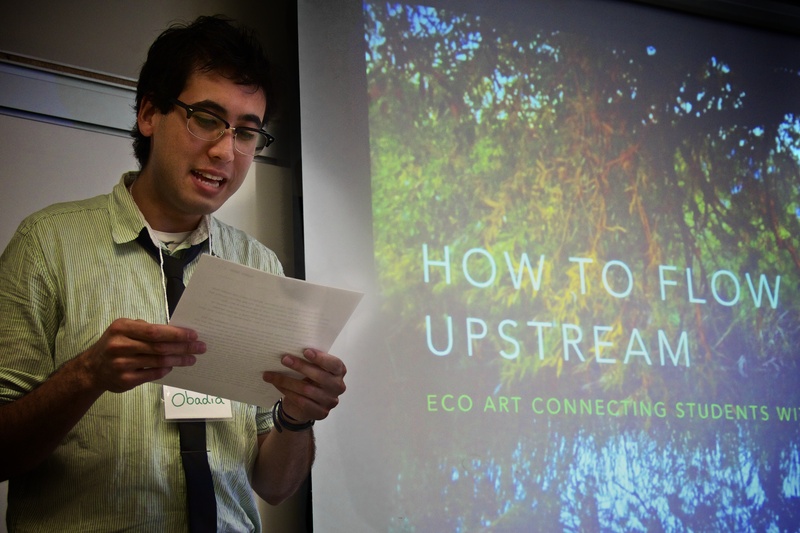 For the past year, Obadia has been using eco art to creatively connect a class of environmental education students with their more-than-human community. The project is also designed to bring attention to the students’ now seven-year struggle to restore the often flooded concrete covered wetland habitat that once ran through their school grounds. Initiated by students’ discovery of blue-listed Western Painted Turtle eggs in their long jump sand pits, this school’s community began coming together to restore the species’ almost extinct habitat and discovered an educational resource gold mine in the process. Originally challenged to raise $100,000 by their school board in order to restore this wetland habitat, multiple “generations” of students remarkably raised $86,000. Unfortunately, in an updated quote, these students have recently found out that their project will now cost half a million dollars. Although this situation has dismayed and disappointed the students and teachers involved, work on this issue ended up creating a process of discovery- how the natural world is an educational resource gold mine. Through the implementation of eco art in their education, these students have shown an aptitude for learning far beyond what is regularly observed of middle school students in a traditional classroom setting. This presentation discusses the details of this endeavour, these students’ inspiring passion for their environment, the role of eco art in the classroom and in school curricula, and helping students negotiate the disappointments and obstacles of bureaucratic intransigence and even, some might say, of dismissal of children’s right to learn from and steward the natural world.